Robert Rodriguez and Frank Miller return to Basin City in this long-awaited sequel to 2005’s powerhouse, ‘Sin City’; the movie that gave the world its greatest cinematic representation of comic book visuals. Even in the decade since, only Zach Snyder has really come close to putting a graphic novel up onto the big screen so faithfully (with ‘The Watchmen’). But, unfortunately, it’s a case of too little, too late for this particular cult bandwagon. Although Rodriguez and Miller have seven of Miller’s original graphic novels to draw from, it seems that most of the best bits were used up in the first movie and, although there’s a lot of good stuff in this sequel, there are also a number of story arcs that don’t quite hit the mark. 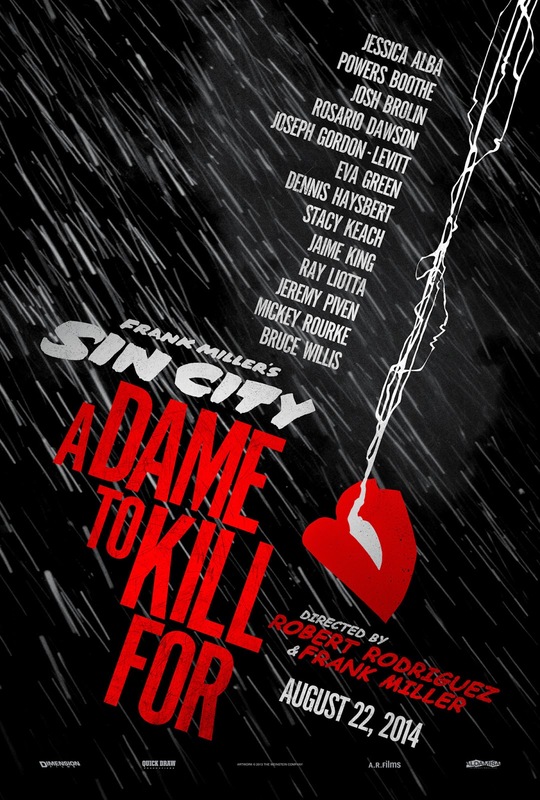 Eva Green is one of the handful of new characters and she plays the titular ‘Dame to Kill For’ with aplomb. It’s unlike her to shy out of baring a little flesh but she goes all out here and absolutely nails the intoxicating purr of masculine desire. Watching her seduce her way around town is a treat and her tale really stands out from the crowd. Less successful is fellow debutant, Joseph Gordon-Levitt, who uncharacteristically hits all the wrong notes in a highly derivative gambling-based storyline. And while poker tables are usually a hotbed for tension, Rodriguez’s card-cutting scenes are almost entirely devoid of any real thrills. That being said, those stacks of cash do provide Rodriguez with one inspired shot in which they chillingly echo the indistinguishable high-rises jutting from the Basin City skyline. And this isn’t the only moment of visual splendor. Rodriguez and Miller make full use of a decades-worth of technological improvements to create an even more sumptuous visual feast. The highly stylized monochrome visuals are gritty and brought to life by a few choice uses of colour that really pack a punch. But that’s Rodriguez to a T; great with a camera and slightly suspect with a pen. Most of these stories feel like off-cuts from the premium offerings of the first film. The grizzled sleaze is still intact, as is the uber-violence, but the meat surrounding it all is too often second rate. One thing that has remained consistent, however, is the cast. Mickey Rourke once again proves that Marv is the role he was born to play and his growling is top-notch. Rosario Dawson and Jessica Alba also prove to be assured hands a second time round, even if Alba’s performance barely extends beyond her gyrating hips for the first hour. But, as is so often the case with delayed sequels, a number of key cast members have dropped out in the intervening years. Josh Brolin comes in for Clive Owen – and, if anything, does the better job of the two – and Dennis Haysbert’s cover for the recently deceased Michael Clarke Duncan is seamless. Far more noticeable, however, is Jamie Chung’s work as Miho. Even in her miniscule screen time she makes a real hash job of playing the silent assassin (honestly, how hard can it be!). Keep your eyes peeled for some neat cameos from the two directors and Doc Brown himself, Christopher Lloyd, and Lady Gaga turning up for two bit-parts. Even in her two minutes, Gaga holds herself better than she did in her whole half hour in Rodriguez’s last movie, ‘Machete Kills’, and she seems to have a real future on the silver screen. Green’s glorious, Levitt’s lousy, Brolin’s burly, Rourke’s rough and Rodriguez is, well . . . Rodriguez; yet again delivering a movie that shows real promise but never lives up to it. Maybe the disappointing box office will kick him up a gear or two to finally deliver that grindhouse masterpiece he’s so desperate to achieve. But, then again, where else are you supposed to go to watch Mickey Rourke crush a man’s skull with his bare hands?